Tampa Bay is continuing to expand opportunities for the cultural society. The Straz Center has Broadway shows, operas, ballets, and orchestral concerts. Florida Museum of Photographic Arts allows patrons a glimpse into different times in history through the lens of a camera. 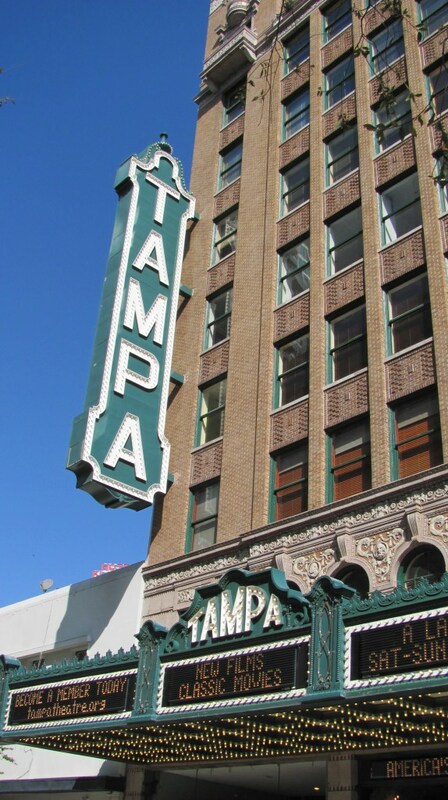 Fashion shows, art festivals, music concerts by the river, and historical treasures like the Tampa Theatre give us the chance to enjoy art in various mediums. What more could we possibly want? Film festivals! Movie patrons are treated each year to a variety of film festivals in the Tampa Bay area. Girl in Progress – Eva Mendes plays Grace, a single mom. She is too busy to give her daughter, Ansiedad, the attention she desperately needs. The movie follows Ansiedad as she journeys through the turbulent teenage years and learns the meaning of being an adult. The Victim – Directed by and starring Michael Biehn (Terminator / Aliens /Tombstone). Annie’s (Jennifer Blanc) life is in jeopardy after she’s witnessed the murder of her closest friend. As she runs from the murderers she meets another man. In this psychological thriller, you will question your trust in mankind. Q&A with the Director and cast after the screening. Silent But Deadly – Directed by Jason Lockhart. Senior citizens living in a retirement community are being killed by a masked murderer. This is a spoof of some well known horror flicks like Scream. Dawn Wells, Lee Meriwether, David Proval, Martin Kove, Rip Taylor, Bruce Vilanch, Jerry Douglas and more star in this comedy. Good Men – Directed by Brian Connors . This short drama, starring film legends Ed Asner (UP/ Mary Tyler Moore Show) and Mark Rydell (On Golden Pond / The Cowboys) is about two elderly Jewish friends who argue over the controversial circumstances surrounding 9/11. Surviving Mommie Dearest – Directed by Christina Crawford. A documentary featuring home movies and historical photos of both Joan and Christina Crawford. It is based on the book by the same name. The Sunscreen Film Festival is one of only twenty-three sponsored by the The Academy of Motion Picture Arts and Sciences. They were chosen, in part, because of the Spanish Language films, like Hecho en Mexico, a movie that captures the beauty and music of Mexico. VIP passes are $150 and include access to all films, parties, workshops and celebrity events . A Day Pass is $50 and is good for the single date purchased only. It includes all films, workshops and that evening’s party for one day during the 2013 Festival. The festival begins Thursday, April 18, at 10:00 am with films and workshops throughout the day. The celebration continues into the night with the Opening Night Party at NOVA 535 from 9PM-Midnight. More films will be shown on Friday, April 19, and the Exclusive Filmmaker Party at the Blue Lucy Art Gallery. No film festival is complete without an awards ceremony, which will be held Saturday, April 20, at The Studio@620 and only accessible with a VIP pass. A group of judges will watch all the films and then vote on them. The panel consists of producers, directors, professors of the World Language department at USF, and more. Some of the awards will be “Best Film”, “Best Documentary”, “Best Director”, “Best Florida Film”, “Best Short film” and “Best Spanish Language Films”. In addition to viewing films and attending parties, the Sunscreen Film Festival is an outstanding learning opportunity for people interested in the film industry. “Educational programs are what we are known for”, said Armer. Workshops include panels by actors, literary managers, producers, screenwriters and filmmakers. Volunteers are needed during the festival to help with check in, distributing badges, and to setup and assist with parties. Volunteers get exclusive behind the scenes access and passes to attend the festival. If you are interested in volunteering, you can email Joanie Sigal, Volunteer Coordinator, at joanie@sunscreenfilmfestival.com. harry@sunscreenfilmfestival.com or 727-420-0566. The cost for the camp is $500. Next year’s film makers can begin submitting their films in September. The entry fee ranges from $30-50. The fee increases as the end of the submission period draws to a close. So get your films in early! For more information, about the film festival, go to http://sunscreenfilmfestival.com. Last month, another popular film festival was held. The Gasparilla International Film Festival (GIFF) first began in the summer of 2006, and has grown into not only source of entertainment but also educational opportunities held year-round. “Empire State”, starring Dwayne Johnson (The Rock) and Liam Helmsworth, is based on a true story about a robbery that took place in the 1980s after a series of false starts and comical interruptions. It premiered at the Tampa Theatre. Actor Colin Farrell made a surprise visit to the Gasparilla International Film Festival. He came to support his friend, Ante Novakovic, a published playwright and poet. His short film, “The Fix” starring Armand Assante, made its Florida premiere at the festival. The story revolves around two lifelong friends who fail their underworld crime mission and have to choose which path to follow. One of the independent films worth watching is “The Long Ride Home”. Producer, Brett Bowker, became interested in making films when he was working as a reporter for a local niche website. His focus was high school lacrosse teams. Kevin Mincio, the main subject of the film, coaches his former high school team. After writing the article, he contacted Thomas Lee Wright to tell him about Mincio and The Ride. “It was a lightning bolt of interest” said Bowker. The three met and the idea for the documentary was created. Wright came on board as the director/producer/writer. The film took four months to film and 7 months in post production. Another Florida film is “PawnZ”. After writing the script for “PawnZ”, Nick Naylor brought it to his friend, Rod Grant for help in finalizing the script. “This was my first attempt at writing a feature film, and I needed some expert advice”, said Naylor. Naylor has been involved in theatre since he began his acting career at the age of five. He continued his passion for acting in feature films and stage productions. Being in the pawn business for 11 years gave Naylor an overabundance of content for his script. It was filmed in various locations throughout Clearwater and Sarasota. Scenes were filmed in actual pawn shops, no sets were used. Sarasota film commission gave them a full access pass to film in St. Armands Circle. It took approximately 7 months to complete. Breaking Up with Rosie is a comedy about a romance novelist who ends up divorced. Karl and Rhonda Wilson began work on the film in the summer of 2011 when he started writing the screenplay. In 2011, they made a short film entitled “Stuporman” and, for the first time, entered it in a contest. It was accepted, and that’s when they decided to make a feature film. The film was shot primarily in Sarasota and Manatee County using local talent. Production took almost 15 months and was completed in January 2012. Their next project “Catching Junior Tate” is an action/comedy about a bounty hunter who travels to Mexico to extradite a bail jumper. For more information about the Gasparilla International Film Festival and to prepare for next year’s event, go to http://gasparillafilmfestival.com/. Take the time to enjoy all that Tampa Bay has to offer in the art world. Help support our cultural society by enjoying a movie at one of the film festivals. Who knows, you may be a part of history, when the next Martin Scorsese or Ron Howard is discovered.